A hand tendon injury is one of the most common injuries your Manhattan sports medicine doctor treats. A hand injury of any kind can put you out of commission for weeks on end, and without the most appropriate and timely hand injury treatment, you could face permanent disabilities. If you’ve hurt your hand, come to our sports injury clinic in NYC to get your pain evaluation and treatment. 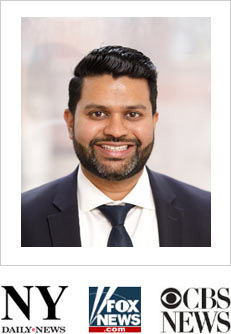 Meet our hand injuries doctor Febin Melepura M.D. to get the pain relief you need in the safe, reassuring hands of the New York’s best rated sports pain management specialists. Any damage to your hands, even the slightest hand injury, can force you to rethink your daily routines. You may even have to rely on others for simple things. Hands are intricate and complicated, with so many moving parts. Whether you’re an athlete, worker, student or retiree, you can benefit from the expertise of a Midtown Manhattan pain management specialist and sports medicine doctor skilled in hand injury treatment. 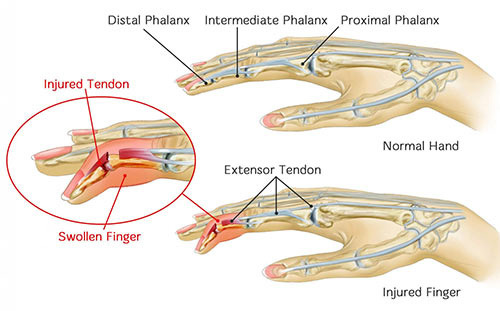 Flexor tendons are those strong fibrous tissues that help you control your hand movements. If you cut your palm — or the underside of your hand, wrist, forearm or fingers — you can damage the flexor tendons. A hand tendon injury such as a deep cut can make it nearly impossible for you to bend your thumb or your fingers. Tendons on the top of your hand are used to straighten your fingers. Since tendons are close to the surface of your skin, a cut that’s deep enough can seriously affect your hand mobility. You’ll know if a tendon was cut because your fingers feel numb. If blood vessels also are cut during the same accident, you may develop gangrene, which can cause you to lose your fingers. A so-called “jersey finger” occurs when a player grabs another player’s jersey and gets his finger wrapped up and pulled in the shirt. The tendon actually gets pulled off the bone when this happens. It usually happens to the ring finger, and it’s one of the most common sports injuries that your Midtown sports medicine doctor has to treat. When your hand and the ligaments, muscles and tendons become weak for any reason, you’re also more at risk of a hand tendon injury. Rheumatoid arthritis is one disease that can lead to a hand tendon injury. When it happens, you don’t even notice it until you can’t bend your fingers. Most hand injuries occur from traumas like falls, direct blows and unnatural twists. When your hand is tired or you’ve used it for repetitive motions for years on end, it tends to be weaker and more prone to accidents. Tell your doctor exactly when the accident happened and provide as much context as possible so that he can form a diagnosis and begin appropriate hand injury treatment. After a thorough medical history and a physical examination of your hand, your doctor may rely on x-rays to see if you have any broken bones. An MRI or arthrogram reveals damage to the ligaments, tendons and muscles in your hand. A longer rehabilitation period is required after surgery, but you should be able to return to your previous level of activity following physical therapy. Do you have any questions about the hand injuries treatment we offer in NYC? Would you like to schedule an appointment with the best rated hand pain management doctor Febin Melepura MD of sports injury clinic in New York? Please contact our office for consultation with the pain relief specialist in Midtown Manhattan.